If you’re an Oklahoma property or business owner, you already know that Oklahoma could unleash powerful storms and tornados capable of widespread destruction. But did you know that Oklahoma public adjusters are available to ensure that you are treated fairly by your insurance company should such an event damage your property? Among the many causes of property loss in Oklahoma are devastating tornados, storms, lightning, fire, smoke, hail, and floods. No matter what caused the damage, one thing is certain: mountains of insurance paperwork to fill out and major insurance headaches. This is where Oklahoma public insurance adjusters come in. Public adjusters, like their private insurance company counterparts, are experts in the insurance claims process. The key difference between these two types of insurance professionals lies in who they work for. 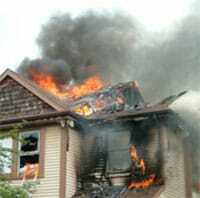 Public adjusters work for you, the general public, while insurance company adjusters work for the insurance company. This difference is important to understand. While your insurance company will provide you with a company adjuster, keep in mind that this adjuster represents the insurance company. He is there to assess the damage and pay for your covered losses while also looking at the damage from the insurance company’s point of view. On the other hand, Oklahoma public adjusters are hired by you. They are there to find as much damage as possible, estimate it using realistic costs, and ensure that the insurance company pays you everything that you are entitled to under the terms of the policy. The public adjuster looks at the damage from your point of view. Because public adjusters scrutinize everything, they often uncover far more damage than the insurance company’s adjusters. The amount of time spent scouring through the damage can be dramatically different with the public adjusters spending hours, if not days, and insurance adjusters stopping by for a quick look. Remember, the burden of proof is on you, the property owner. It’s simply not in the insurance company’s job description, nor in its best interest, to find every possible loss. It is, however, in the public insurance adjuster’s best interest to do so. Oklahoma public adjusters are paid a percentage of the final settlement, which is a crucial motivator to uncover everything. 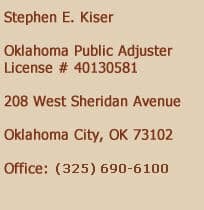 Like private insurance adjusters, Oklahoma public adjusters must be licensed by the state and comply with specific statutes and regulations. • Detailed inventories and replacement cost estimates – Complete inventories detailing all losses along with replacement cost estimates. • Insurance policy review – Few policyholders fully understand the terms, conditions, and exclusions contained in their insurance policies which puts them in a terrible bargaining position. Policyholders who have public adjusters on their side have the advantage of a professional who knows exactly what the policy means. • Property damage and loss estimates – Public insurance adjusters create detailed estimates covering all losses and using local building codes, costs, and traditions to ensure the most accurate estimates possible. • Help filing paperwork – Public adjusters deal with all of the insurance paperwork on your behalf. • Direct negotiations with your insurance company – Public insurance adjusters represent you and negotiate directly with your insurance company. If a settlement offer is too low, doesn’t consider all of your damage, or non-existent, a public adjuster presents the documentation and negotiates a better settlement on your behalf.